Can I use this tulip dessert dish for hot applications? This dessert dish is not recommended for hot applications. 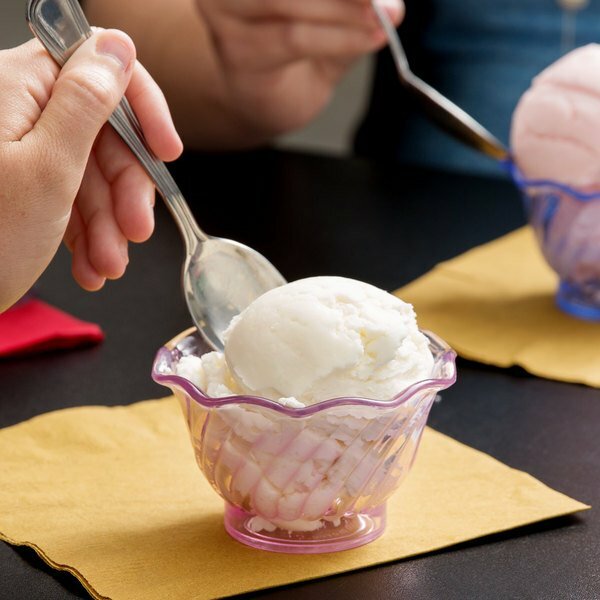 It is best suited for ice cream, fruit, custard, and other cold desserts. Why does my packaging say this is the color purple? Depending on how this item is manufactured, the finished product could either look more purple or pink in color. Product color will resemble what is in the photo. Use this 5 oz. pink/purple dessert dish to create a unique way to present your guests with savory ice cream, juicy fruit medleys, and other delicious desserts! 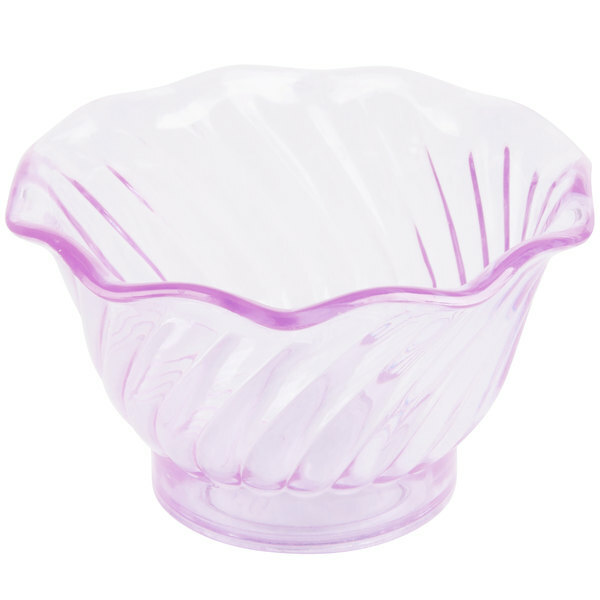 The swirling, wavy bowl design provides a fun yet elegant base for your signature menu items and the transparent, pink/purple-tinted plastic is perfect for complementing the bright, vibrant colors of fruit, sweet desserts, and signature side dishes. No matter how messy this dish gets the smooth finish and convenient size allows for an easy clean up, plus it'll withstand just about any abuse your customers may put it through. Thanks to its sturdy acrylic SAN (styrene acrylonitrile) plastic construction, it provides exceptional durability and is virtually unbreakable, ensuring a long-lasting and reliable performance in your business. From classic ice cream sundaes to colorful fruit salads, this tulip-inspired dish is sure to enhance the look of just about any dessert! Great little dessert cups and I feel like these are just the perfect size for little scoops of hard ice cream. Nice light pink color. this 5 oz tulip dessert dish is a super value product. and it looks great on the tables. our dessert sales increased when we started using these. great design for desserts! it is adorable and they have various colors depending on what the theme is in your restaurant. its pretty inexpensive as well. loved them . Will be able to use them for various things. The color is pleasing to the eye. Able to view the contents in bowl.